With digital strategies increasingly taking center stage in many businesses, more CIOs are reporting to the CEO. However, the tech talent dearth threatens CIOs ability to conduct their work. Thirty-four percent of CIOs surveyed report directly to their CEO, further validating how IT has become increasingly strategic as businesses seek to generate more money using digital technologies, according to the new 2016 Harvey Nash/KPMG CIO survey. 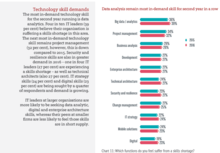 However, 65 percent of CIOs say the lack of technical talent -- particularly for big data analytics -- is hampering their efforts to keep up with the pace of change. Marc Snyder, who manages KPMG’s CIO advisory global center of excellence, says the number of CIOs reporting to CEOs was a 10 percent hike from the 2015 study, suggesting that more CEOs view their IT leaders are key business partners. Snyder says that 21 percent of respondents say their CEOs are formulating digital strategies but expect CIOs to choreograph the necessary technology and business process changes. As a result, CIOs are focusing more on innovation and less on the operational efforts. CIOs are steering employees through new ways of working, delivering technologies that enable better customer engagement. And as they direct organizational changes they are spending more time getting to know their customers. Four out of 10 respondents indicate they spend at least one day a week on something other than IT. “CIOs are no longer focused solely on delivering the right technology to enable the enterprise, rather they are now the key agent of change for moving enterprise strategy forward," says Snyder. The research included participation from 3,352 CIOs worldwide between December and April. The CIO may be enjoying elevated status but the role's challenges have also increased. As they attempt to execute on the digital strategy, CIOs are starving for talent, particularly for professionals who can glean insights from large volumes of data, as well as employees who can cultivate digital capabilities and protect corporate assets from hackers. Forty-four percent of those surveyed said they planned to bolster their IT staff in 2016. 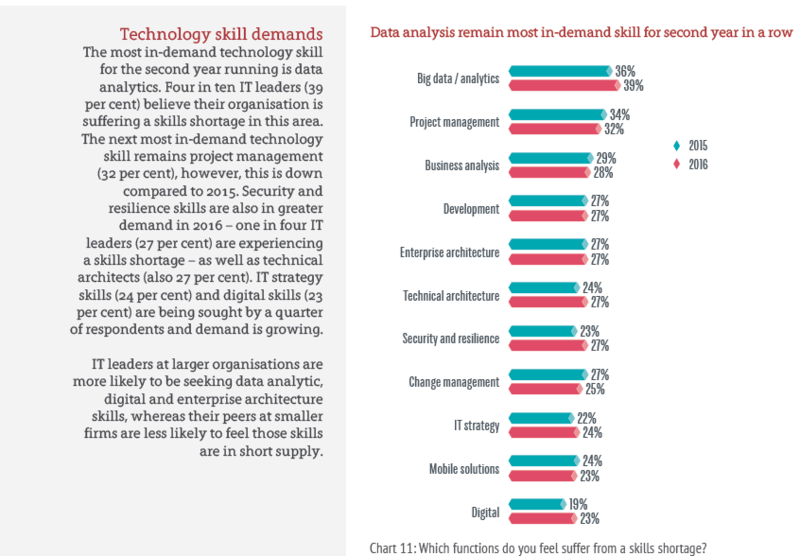 At 39 percent, data analytics is the most in-demand skill for the second consecutive year, followed by project management at 32 percent, business analysis at 28 percent and cybersecurity at 27 percent. Nearly a third of those surveyed reported that they had to respond to a major security incident in the last two years. They cited organized cybercrime at the top of this list of attacks, followed by amateur hackers came and malicious insiders. Only 22 percent of CIOs said they "feel confident" their organization is very well-prepared to identify and respond to cyberattacks. Snyder says the CIOs' rise to direct report and partner to the CEO means that talk of turf wars among CMOs, and more recently with CDOs, is fading. For example, while the number of CDOs spiked to 17 percent in 2015 from 7 percent in 2014 in their previous surveys, Harvey Nash and KPMG found that the number only rose only 2 percent to 19 percent for 2016. This suggests the CDO hype has peaked and that CIOs remain the most integral C-suite leader to shepherd the current transformation wave. Moreover, Snyder says that evidence that CMOs will control the bulk of technology spending is not materializing. While marketing may be spending more money on technology than it has in the past, it still requires CIOs to connect systems of engagement to back-end systems, including connecting newer cloud software to legacy systems. As a result, Snyder says IT (16 percent) is almost twice as likely to “own” digital as its marketing peers (9 percent). "The whole digital thing is not just digital lipstick on the marketing pig, but is rather a move to create stable, sustainable systems," Snyder says. 57 percent of CIOs sit on their corporate board, up by more than half from 11 years ago. CDOs are twice as likely to report to the CEO (46 percent) than to the CIO (21 percent). Women in senior IT leadership roles has risen by a third, up from 6 to 9 percent in the last year. 16 percent of the U.S. survey respondents were female, compared to 11 percent of the global respondents. A third of IT leaders have a formal diversity initiative in operation, and a further 23 percent have plans for formal initiatives in future. While the tone of the Harvey Nash/KPMG survey is bullish overall, it’s still the early days for the current digital transformation wave. Another recent study by KPMG (conducted with Forbes Insights) reported that based on a poll of 509 executives in North America only 25 percent of enterprises have an integrated digital strategy and just over 20 percent believe their organizations are highly advanced at applying digital initiatives to deliver business value. That could pose a problem at a time when digitally native companies such as Uber, Amazon.com and comparable disruptors across various industries are poaching customers from analog companies. The survey offers a sober window into a harsh reality. Most companies don't have a progressive strategy that meshes and mobilizes the online and physical worlds. Those businesses risk losing customers to more digitally savvy rivals. Moreover, companies that have fragmented efforts or bet on the wrong strategy entirely can lose years in market momentum. “Digital startups are eating away at pieces of legacy value chains and completely disrupting the business world,” says Rick Wright, KPMG U.S. digital and mobile solutions leader.